On April 2, the DOL's Wage and Hour Division issued a triad of new opinion letters addressing FLSA issues: the "8 and 80" overtime pay system; the teacher exemption; and the application of the agricultural exemption. New Mexico will increase the minimum wage rate, effective January 1, 2020. Beginning January 1, 2020, the rate will be $9.00 an hour, $10.50, effective January 1, 2021, $11.50, effective January 1, 2022, and $12 effective January 1, 2023. The Social Security Administration is soliciting comments from the public regarding one form and information gathering activity, SSA-L3231-C1, Employer Verification of Records for Children Under Age Seven, that has been submitted for clearance by the Office of Management and Budget (OMB). A bill to provide updates to Washington's new Paid Family and Medical Leave program was signed into law by Gov. Jay Inslee on April 3. House Bill 1399 makes several technical corrections to the new program, and clarifies a key provision related to supplementing wages while an employee is out on leave. The Employment Security Department operates the program. Payroll and Unemployment Insurance NetNews is a current summary of federal and state employment laws and regulations, compliance issues, and other topics related to proper handling of day to day workplace matters. 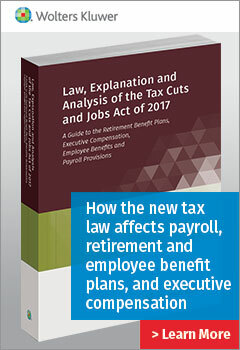 This timely information comes from the Payroll Management Guide and Unemployment Insurance Reporter with Social Security.